ORIENTing features the work of Ian Fairweather and his relationship with Asia. This exhibition will be shown at the Lawrence Wilson Art Gallery from 4 May until 13 July 2013. Artwork featured: Ian Fairweather, (Landscape, Soochow), 1945-47, gouache on paper, 21 x 19.5 cm © Ian Fairweather/DACS. Licensed by Viscopy, 2013. 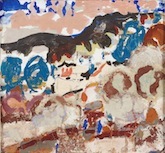 The exhibition considers the work of Ian Fairweather and his relationship with Asia, investigating the artist's unique positioning in Australian art history and his commitment to cross-cultural engagement. Using Fairweather as a springboard Aaron Seeto will explore the current re-positioning being undertaken by contemporary Australian/Asian artists as they reflect upon and engage with the rich cultural environment to our north. ORIENTing is an exhibition in two parts, each exploring a different aspect of artistic engagement with Asia. More information about the exhibition, artists, artwork and the catalogue is available online via this website. The Campus Partners for ORIENTing is the Confucius Institute and Asian Studies department at the University of Western Australia.